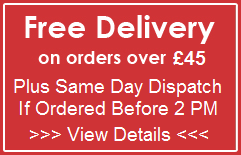 UK orders up to £44.99, delivery charge £3.99 per order. UK orders £85 and over, delivery FREE of charge. EU Countries, orders up to £100.00, delivery charge £14.99 per order. EU Countries, orders £100.01 and over, delivery charge £19.99 per order. Rest of The World, delivery charge £29.99 per order. Orders placed before 2pm Monday-Friday (exc public & bank holidays) are shipped the same day. Delivery times may vary depending on location but as a guide line UK deliveries should be within 2-3 working days, all other area’s within 7 days.